But everything changed one day , He left his home and meets her best friend, who after a while you see that on the outskirts of the city men who wear purple and black suits apparently threaten a girl who apparently refuses to deliver a suitcase carries , then PLAYER and her friend to see it , are directed to try to help , but did not know that the 2 men were coaches and would not hesitate to use their pokemon, but because of the uproar they caused, the men wanting to decide to go unnoticed , threatening that they will return . 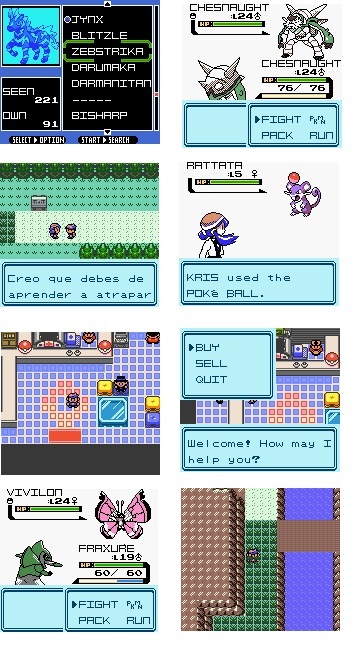 After that the girl who first helped risk scolds coaches fight , but then thanks them which have saved , and I will say it is the teacher’s assistant elm , and that the bag she carried was an important research that the famous Professor Oak will request , and then tell them your name is KRIS . Then tell them to go to the lab in spring town , where I told him what happened to Prof. Elm, which after reaching the value is amazed at enfrentase had two thugs, why is when they give you a pokemon to be coaches to return , saying they have to be big wooden coaches, and that ‘s not a mistake, since for years discovered the talent of a guy who started from scratch and made ​​it big. According to a legend existed a powerful alien dragon that formerly was called ” the legendary original” , but his body was divided into three , resulting in another 2 dragons, gamma team now wants to take that legendary , using energy of mysterious orbs, but need 2 people that their ideology is based on truth and justice , to attract the two legendary dragons and so to see the third legendary , the dragon power balance and unite the three to revive the legendary original, which will return to the top of Mt silver to be under the orders of whom met all three. This is how you and your friend are tricked team interests gamma MUST now join forces to save once again to johto , now a real threat. • A fuller history than gold and silver. • To go to the league now must beat the 16 leaders johto and kanto . • There will be small cameos of Gold , Silver and Kris to help in some parts of the game. • Pokedex reformatted and only three legendary . • Some places that were not included in gold and silver will be reopened , as the viridian forest and Seafoam islands. • Mapping of some routes courtesy of Pokemon HeartGold . • Gender Selection ! ! !